There are so many successful singing competition shows now that each show has to really produce some interesting and just plain talented people to get people to tune in. If you don’t do that there are so many other shows to tune into to get what you’re looking for. Personality is such a huge part of being able to draw in the votes and captivating the audience when it comes to American Idol. The other shows have a lot of production behind them, where AI is still pretty stripped down. Which gives it sadly more of a karaoke feel I think. However, sometimes on the X-Factor I feel like there is this whole production for an artist that is not even relevant. The Voice probably does the best job of finding some balance and really highlighting the talent, vocally & otherwise. But I digress, we are talking about Idol here. Who’s idea was it for the poor girls to do Whitney Houston? There’s a very small percentage of even the most successful female singers in the industry that can tackle such a great vocalist. I felt bad for the girls actually, many of them hit a brick wall this week. As for the boys Stevie Wonder is one of my favorites of all time, but his music is starting to feel a little said & done when it comes to these shows. When is someone going to give me a TV show thats going to introduce me to new music? I will just have to deal with the cards that are dealt, and so will the contestants. So how did our top 13 do? I wrote a little blip about each of them, but have not been successful in finding the performances on youtube so there are not videos to link. As a temporary solution I have linked their AI page to their names, until I can find a reliable stash of youtube videos you will just have to take my word for it if you missed the show. The show kicks off with Joshua Ledet performing my favorite Stevie Wonder song, ‘I Wish.’ Completely forgettable, anti-climatic and not impressive. Could not even believe the judges were placing this at the top of the night. Clearly they missed Marcus Canty’s rendition on The X-Factor because he killed this song. Even though I still have my doubts and suspicions that not all of the X-Factor is done without a little technical help (i.e. 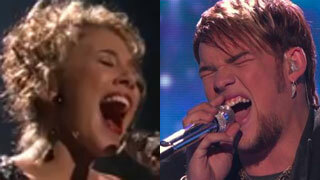 I think lip-syncing could be involved) this performance on Idol did not even compare. Elise Testone performed “I’m Your Baby Tonight” crash & burn, this was utterly painful. I needed to go back to her audition tape to figure out how she ended up on this stage. Her attitude did not help, she just looked mad which doesn’t translate well to getting viewers at home to vote for you. Her voice is unique and there is not a whole lot that this show is going to do for her. 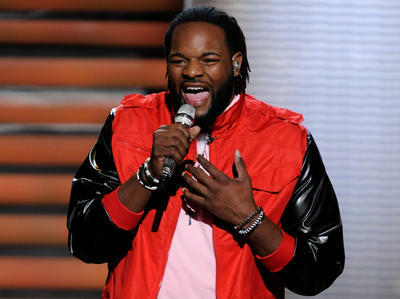 At the end of the day you’re on American Idol, and you got to roll with the punches when it comes to your song choices. You are no longer your own artist making your own decisions. She’s got to be one of the bottom girls or I’m moving to another country. Jermaine Jones – “Knocks Me Off My Feet,” this was a snoozefest for me. I think that his voice is cool and smooth and all, but I guess I don’t feel it like everyone else does. Sadly I probably won’t appreciate him until I hear some of that Michael McCary, Boyz II Men bass. Just sayin. Erika Van Pelt – A Whitney song was a stretch and push for her. She did “I Believe in You and Me,” I was prepared to hate this, and I’m not really saying that I didn’t hate it. It was hard to love, there were parts that were shaky but overall I was impressed with her range, probably only because I didn’t know she had it. I don’t know if there’s a lot more to uncover with this one like the judges are assuring but I do want her to stick around awhile longer so we can dig into that rasp in her voice. Colton Dixon was so nervous for tonight but it wasn’t bad. Stevie Wonder is way out of his element and that was something the show wanted to be made known. His style was enough to make it sound like his own. He was one of my favorites of the night and he’s going to be around for a long while. He better just get used to being pushed into doing styles and genres that don’t necessarily fit in his realm, because that’s just American Idol for you. Shannon Magrane – I was sad about this performance. There’s something about her that I can’t help but want her to do good. I think her nerves probably got to her, she’s young. She missed a big note. Did anybody really listen to her sing that in the rehearsal, it was a night and day difference. I think she’s actually capable of big things but who knows if we will actually be lucky enough to see it. 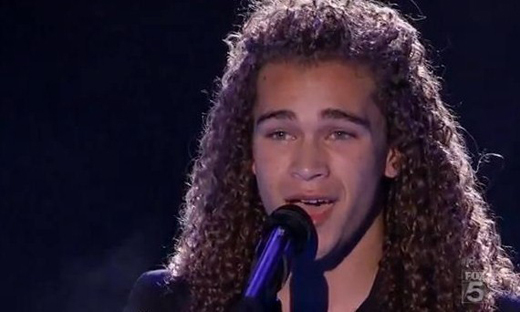 DeAndre Brackensick – I hated whatever song he did last week but doing “Master Blaster” seemed to be right in his element. The hopping around was a little distracting. He was feeling it. I guess I like his voice… but he annoys me. I will try to be more open minded but there’s not much else to say. Skylar Laine – There is something weirdly charming about Skylar to me. She was crazy last week on stage, probably how I would look if I ever had to get up on stage and sing a song. You know she is feeling every single note. She makes everything look so darn easy and effortless. She belt out that Whitney song like she’s been singing it all her life, and you know she hasn’t because she’s a straight up country girl. I can’t believe I’m saying it but I dig her. She’s definitely one of my early faves. Heejun Han – I hope he stays around for awhile. Is his voice spectacular? I don’t exactly think so, but he’s got a sense of humor, he makes me laugh and makes the show slightly more interesting. 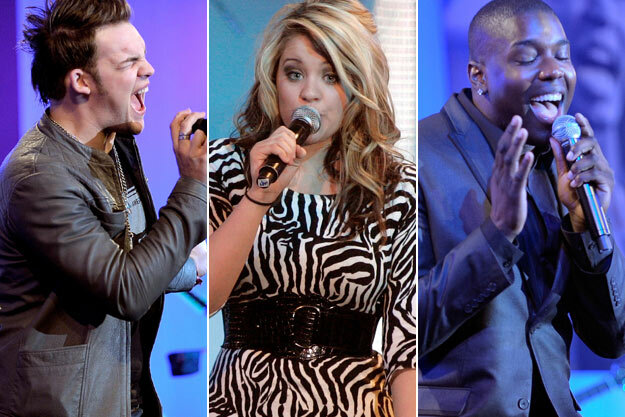 Hollie Cavanagh – She slayed a Christina Aguilera song last week so we know she has a huge voice. I had no real concerns about her performing Whitney, I just knew her voice was one of the very few big enough that could pull it off. And she did, it was beautiful. I want to see her loosen up, she’s totally the Pia of this season when it comes to having the voice but lacking the strong stage presence. She’s got a big smile, but I need to see her having actual fun on stage. Jeremy Rosado – I couldn’t even tell you what Stevie song he sang. He has a beautiful voice but it’s just not enough. Seems like a nice guy but, the end of the road is coming soon for him. I literally have nothing interesting to say about this one. 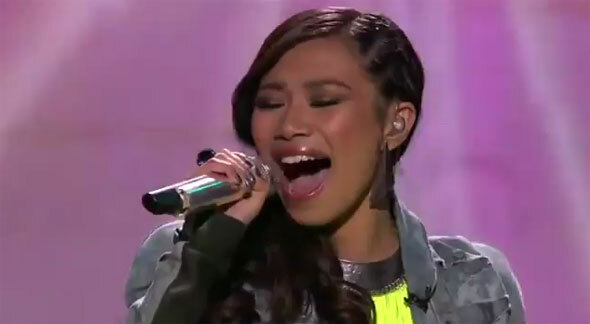 Jessica Sanchez – It takes balls to step out and decide to do “I Will Always Love You.” By far biggest Whitney song, one of the biggest ballads of all time. I kept thinking, how darn brave. She stepped out and just nailed it. I thought it was pretty much flawless beginning to end. The difficulty of this song is indescribable. My jaw dropped to the floor watching her hit all the notes. It was awesome. 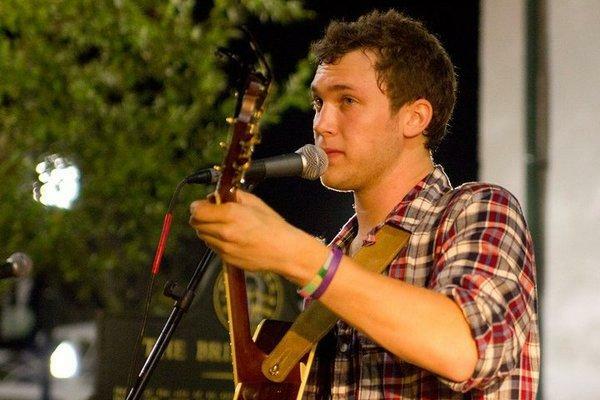 Phillip Phillips – I have so much to say about this kid. No surprise here that I did most of my pre-American Idol live show research on him. Don’t get me started on the Dave Matthews comparisons because it seems to get me upset. Let’s focus on what happened tonight. Was there any other Stevie song for him to do? Does no one want to mention that he already sang this in his audition? I mean I don’t care because it was absolutely incredible. But he had an advantage, a lot of hours put in already preparing for this performance. At the end of the day for me, nothing can compare to someone that is as musically inclined as he is. He used his ear and his musical style, and he made “Superstition” into his own song. I’m so ready for the days when American idol evolves into more than just a singing competition and the contestants get some credit for picking up an instrument and making a performance more than a sing-a-long. I’m all about a musician, not just someone with a big voice. 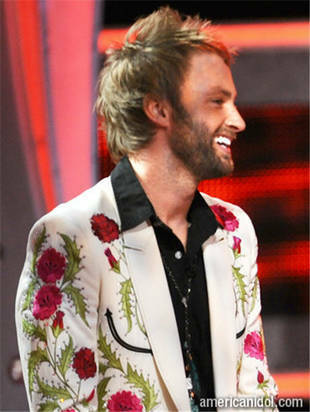 Phillip Phillip’s is my dream come true this year, my Paul McDonald but with more control over his voice. I’m ridiculously excited to see what comes from him throughout this season. He better not disappoint me! Not sure where to begin with this Idol nonsense. It may have been the worst top 4 performances that I’ve ever seen. I was highly disappointed in all the song choices. I was even more disappointed in the judges and the production. I have plenty of conspiracy theories, and based on what I’m reading on other blogs and Twitter, I’m not the only one. The motives behind why they are partial to certain contestants over others is something that I have yet to figure out. It’s certainly made for a frustrating season to watch as a viewer. Lets get into it. James begins the show with “Don’t Stop Believing.” My first thought was, oh, interesting that he’s the lead performer and won’t close out the show. Little did I know that they would switch it around at the end to give him the “pimp spot.” So James not only opens the show, but he then gets to for the 4th time this season close it out. So let’s get around to my second thought, who doesn’t know this song? How many times have you gone to a karaoke bar and not heard someone belt this out. I think the song choice was a great one, but he didn’t do anything with it. The judges are always talking about James adding his style to songs. This could have worked had he have added a rocker vibe to it. But did anyone even notice that it wasn’t good? He sang off key, it was boring, it was screechy and just plain hurt my ears. But yet the judges are his biggest cheerleader. I was looking forwarded to his second performance, “Love Potion No. 9.” But he added his rock vibe and the song was lost in translation for me. I guess he’s damned if he does, damned if he doesn’t with me. But I truly was feeling the acoustic version he was performing for Gaga and could see that as being a better performance. But what’s the use in talking about James anymore, is anyone listening? Back to Haley world. Randy talked about the difficulty in singing “Don’t Stop Believing,” excuse me… “Earth Song” by Michael Jackson is killer. I know this from personal experience of trying to belt this out alone in my car. This song is so tough with the notes, runs, and emotion. I don’t think it was the best song choice for the mere fact of having to cut the song time down. This is a perfect song that you can’t change, it has an impeccable amount of build up and explosion. It didn’t translate well because she had to make the jump from a calm soulful beginning to screaming emotion. Sooooo the judges didn’t like it, imagine that. And this time I could see where the comments were coming from, where other times I think that they are way off. But they are always picking on her. The problem I have is how they went on and on about it. It has to be so hard for her. I know people don’t like to see her talk back, but put yourself in her shoes. She’s just trying to defend herself. I wouldn’t care in the least if they were giving the sort of feedback they give her to everyone. James performed that Journey song right before her and it was terrible. But all James got was praise, it’s getting to be ridiculous how much they hate on Haley. Even after watching two more contestants perform, the judges go back only to reiterate the fact that Haley’s performance was the worst. This is just moments before her second performance on a live show. How does one pull themself together? They completely rattled her and I think that was the goal. I thought this week would play in her favor since she did such an incredible job last week with her rendition of Gaga’s “You and I.” Funny how not much if anything was mentioned in the reel about the performance. I know that footage has to be there, Gaga would have said something about it upon meeting her. I also have a strong feeling that Gaga digs Haley’s voice and style. It’s interesting that there wasn’t a whole lot to take away from the Gaga clip with Haley, besides an acting/drama lesson? Her second performance of, “I Who Have Nothing,” was certainly an improvement. I would have liked to have seen her do a more exciting/fun song. Thankfully she didn’t because it would have been hard to come out and have fun after the first round. Scotty, I want to give him the benefit of the doubt with the Alan Jackson song, “Where Were You When the World Stopped Turning.” It’s hard though, I think mostly due to my PR background, I’m always questioning peoples motives. I mean come on, could this type of song be chosen at a better time? I really don’t think so, and I would find it hard to believe he wasn’t prepped for the pre-interview for the song. He said all the right things. And he’s just a kid, to capture that emotion has got to be difficult. He had to of been about 6 years old when 9/11 happened. However, I will say this… he did an excellent job of telling the story. As much as I was doubting his involvement with the song choice, there were moments in the song that gave me the chills. Which, again is probably due to everything that is happening in our country right now. It was a smart move. Now his second song, lordy… so bad. He performed, “Young Blood,” by the Coasters. What were those crazy eyes? I have no words. The young girls love him, I don’t think that performance hurt him much as far as voting is concerned but really what was that? So creepy. Both songs Lauren performed were amazing. She is my overall winner of the night, hands down. I was worried how she would recover from her near departure last week. She sang Martina McBrides, “Anyway” and Elvis Presleys, “Trouble.” I mean the second song was a little out there, because she’s the furthest thing from evil. I think it could have been better had she have been able to channel the character a little more. But wow, the first song she just belted out beautifully (again a song about natural disasters, could it have come at a better time?) And the second song she had fun with. It was a great night for her. 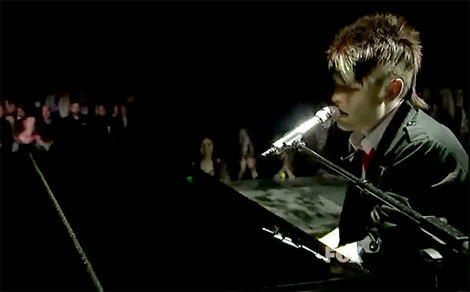 James did, “Closer to the Edge,” a 30 Second to Mars song. It gave him some relevancy in my mind of where he would fit in post Idol. When he sang “Without You,” it took me right back to the first time I heard Kelly Clarkson sing it. Her vocal performance on that song in particular has been cemented in my head since the day I heard it. Obviously his sound is very different than Clarkson so the two didn’t compare. I sort of liked the vibe he brought to the song. It wasn’t even close to being his best vocal performance but the crying kind of pulled me into the performance. Even with his rocker swagger he finds ways to make himself vulnerable and relate to the audience. Not easy to do. Despite the fact that he sounded probably his worst the judges ate the performance up, per usual. The audience is practically brainwashed into voting for him with the constant praise from the judges. It would be so shocking if he went home anytime soon. I do worry that he is going to struggle after Idol. Whether he wins it or not, I see him going for a genre that is not the easiest to break into. There are so many barriers and the audience is a tough crowd to please. I think the general population is going to have a hard time accepting him because of his Idol background. Adam Lambert was able to find his niche but James won’t be able to follow that path. He seems to be getting a lot of support and praise from the bands he’s been covering. That will help him. Two weeks ago I would have said there is no way for Scotty to win the whole thing. But man he’s had some strong performances when it has really counted. I’m thinking Scotty might be here to stay. His Montgomery Gentry performance was so good. Then he followed up with “Always on my Mind.” Both performances showed how well rounded he is as a country artist. He had a great night. They haven’t crowned a male, country singer for the top prize. I mean he’s going to thrive post Idol in the country scene, so then AI can take credit for launching both Carrie Underwood and Scotty McCreery. It would give the show more credibility. How can they not have him win? I loved Lauren. I think its incredible the turn around shes made in the last 3 weeks. She has taken all the important steps to move forward in this competition. You can absolutely tell that she’s putting in the work to try and win this thing. I think she would be one of the most exciting people to watch win it. You can tell that it’s her dream. She broke down tonight when she found out she was one of the bottom two. It will be interesting to see if she can bounce back from that or if she will play it safe next week out of fear of elimination. I was disappointed to see her in the bottom two after she had just pushed herself with her two songs this week. Ah, Haley… what a breath of fresh air. I completely disagree with what Randy and JLo said about her needing to find a song that the audience already knows. It was completely risky, but it paid off. I always refer to Idol as a glorified karaoke contest. Here Haley comes in and just kills this unreleased Gaga song, that for the most part no one has heard. Haley did such a phenomenal job that it could easily be her first single. It didn’t sound like anyones song but her own, which has got to be one of the most important things to me. All the contestants sound great and record the tracks week after week, but the ones that I choose to buy and download are ones that are unique. I don’t want just another decent cover of a song. I want one that makes people forget that it’s a cover, that they really have to sit for a second and think about what the original sounds like. Season 8 contestant, Allison Iraheta did “I Can’t Make You Love Me” and whenever someone I’m with hears it play they think its killer. Haley closed the show with “House of the Rising Sun.” People are saying that it’s the best performance on the Idol stage of all time. It’s right up there for me. At the moment I can’t think of another performance in all the other seasons that I like better. It was just beautiful. On to the results show. I was concerned about Jennifer performing on the show. She’s using Idol to her personal advantage and some seem to have mixed feelings about that. I think they chose the perfect time to let her perform. Had she of done it too early I don’t believe the audience would be as accepting. On the flip side you don’t want her performing too close to the finale. So I guess if she was going to have to make her appearance they chose the best time for it. I didn’t find it too entertaining. It’s difficult because she needed to sing live since it is “American Idol” and she would have received an insane amount of criticism if she didn’t. However, Jennifer is an incredible performer mostly because of her dancing. We didn’t get to see all that. She did what she could with it, but for me it just wasn’t enough. Wednesday, Jacob finally received the criticism that he needed to hear. He says that he can relate to all kinds of music. I disagree. He oversold himself. One minute he’s telling us he can’t sing a Marvin Gaye song… the next he’s trying to tell us his direction is Jordin Sparks/Chris Brown. The kid belongs on Broadway, in Gospel music, that’s his niche and because he didn’t tap in to that completely thats why he went home. I’m very surprised he made it as far as he did. So yeah, goodbye Jacob. I’m sorry to say that I have been awaiting your departure for some time now. Not sad at all to see you go. I’m sure Casey pleased his fans with Creedence Clearwater Revival. It was definitely cool to hear a song of theirs on the Idol stage. And with him playing the upright bass, you just don’t see that everyday. I loved it. Amazing performance. Pia chose an uptempo song, finally. I just don’t know how someone can have an incredible voice like she does and then I just sit at home feeling indifferent about her. And I think I finally put some pieces together as to why. The judges keep pushing Pia to develop stage presence, and no doubt about it she’s doing her best to gain control of the stage. But she has no rhythm, it’s not her fault. But because she can’t move, I think it’s hard to see her feel the music. She relies so heavily on her voice just as it is, but she doesn’t make me believe in anything. Now Haley made me believe in something. I think she’s the dark horse this season. She’s really improving each week and I hope she gets to stick around longer. She sings with conviction, its a truly beautiful thing. I think the past two or three weeks she’s found her niche and she just needs to hang in the competition. Her voice can carry itself but when she is actually feeling the song, her performances are just so impressive. And Paul was back in action this tonight after being in the bottom three last week. He sang “Folsom Prison Blues,” by Johnny Cash and killed it. He had the last slot of the night and it felt like an encore. 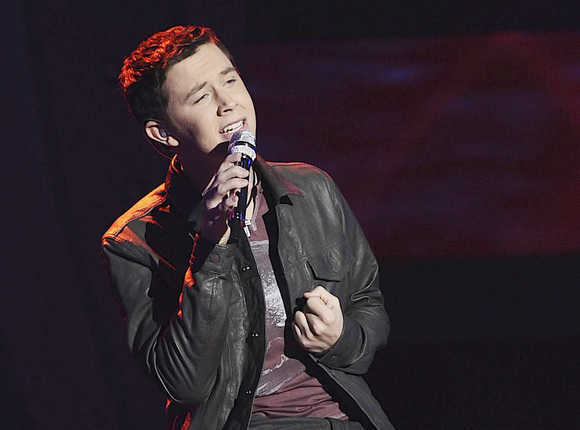 It’s still so strange for me to see an artist like him on the American Idol stage. He’s playing to a tough crowd that is familiar with and responds well to the Pia Toscano’s of the competition. But tonights performance is what Paul is about, it felt sooo good! He is no doubt the kind of artist I want to see in concert. He clearly knows how to rock out. Its incredible to see some real musicians on stage this season. Idol has come a long way over the past couple years. James slowed it down with, “While My Guitar Gently Weeps”. However I didn’t enjoy it as much as I thought I would. Lauren performed a mediocre version of Natural Woman. The song is overdone, it gets performed just about every season and honestly I don’t think anyone has performed it better than Kelly Clarkson, since she slayed it in season 1. It’s a tough song to sing and while I liked seeing Lauren more relaxed, overall it didn’t blow me away. Jacob did “Man in the Mirror” by Michael Jackson. It’s rare when I’m impressed by a MJ cover and his rendition was no different. I liked that he brought his own “Jacob” flavor, but at the same time the original is just too good to touch. He got a positive response, (but at this point who doesn’t on this show). It’s a big love fest with the judges, for no apparent reason. The contestants are good but not as amazing as the judges seem to think. Idol was yet another week of disappointment. I think the only way that last night could have been enjoyed is if you are a die hard Elton John fan, but maybe I’m wrong, let me know if I am. I was more or less bored to tears. Haley was hands down the best performance of the night. I am beyond proud of her for just killing “Bennie and the Jets.” It was just perfect. Like Jimmy Iovine said, she put it all together with this song. Her voice is amazing, she was confident and beautiful on stage. I don’t know if there is anything bad you can say about her performance. I was smiling ear to ear. It was a wonderful ending to a subpar night of Idol. Casey, phenomenal. He sang, “Your Song.” He mellowed out a little bit which I think will cater to the mainstream audience. Personally I think his craziness but there’s a time and a place. He was stripped down and I think this was a smart move for him. After last week’s surprise save, he killed it. The song choice was perfect and it gave the audience a chance to connect with him again. Lauren – Ah, the old “Candle in the Wind.” She sang it so beautifully. I was so impressed. She has such a great country voice and I love what she did with that song. Pia, the judges want to see her move and take over the stage. Watch her tonight on the elimination episode when she’s doing the group performance. Talk about someone that can’t dance. It’s not a dancing show so I don’t care if she can dance or not, but the girl seriously has no rhythm. It’s no wonder she plays it safe on the stage during her performances. Paul’s performance, I just didn’t connect to it. And if I didn’t, I guarantee those that are on the fence about Paul didn’t either. Total bummer. Paul is a sincere, honest, amazing artist. He’s so out of place on the Idol stage. To try and make people understand and feel him when he’s singing cover songs week after week… it’s no easy feat. He doesn’t belong here. I need the Indie rocker back, singing songs that he believes in. James performance was not visually appealing to me. It was probably wonderful if you were in the audience but there was too much going on. The camera was chasing him around the place and a piano on fire. Not to mention his performances are all starting to sound the same to me. I thought this week would suit him well because he would be forced to change it up and show another side. Didn’t happen, oh well. Personally I’m ready for Naima and Thia to get the boot. What Naima tried to do this week was hard, changing a classic Elton John song. As always, I appreciate her efforts. She wants to make a song her own, but this wasn’t the week to mess around. And Thia, she’s just not that entertaining. If anyone else goes home I will probably be disappointed.